What happens when you combine the most intense and effective jump rope intervals with cutting-edge ab exercises that carve 6-pack abs? You discover an addicting way to finish of ANY of your favorite workouts while burning ugly belly fat and stubborn love handles (aka spare tires) without any back-breaking crunches or sit-ups and without ANY cardio. This new Metabolic Finishers program can be used with ANY workout program and will burn your most stubborn belly fat. You’ll work your abs harder and burn fat at the same time with these heart-pounding Jump Rope Finishers. P.S. There is NO RISK at all for you to try this Metabolic Finisher program. 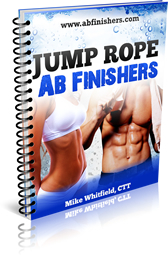 If you are not thrilled with Jump Rope Ab Finishers program in 60 days, let us know and we’ll refund every penny. Your satisfaction is 100% guaranteed. My workout programs have already been seen on Men’s Health, Turbulence Training and used by thousands of men and women, and I guarantee it will work for you, too.